The original Nike Cortez colourway that debuted way back in 1972 is returning more than 40 years on. Widely considered Nike’s first design masterpiece, the OG edition made several appearances in Hollywood films including as the pair Tom Hanks laced up Forrest Gump. The style features a white leather upper flanked by royal blue detailing on the midsole and a varsity red Swoosh on the side panels… Run Forrest, run! Available at Nike, priced £65. Lacoste is taking the trainer for a walk on the wild side with the launch of its brand new Explorateur model. Unashamedly robust and masculine, the toughened mudguard wraps and bonded zips makes other styles look like big girls’… shoes? It comes in two versions, the original mid-top and a slimmer low-top version under the brand’s Sport range. It’s fair to say most of us don’t want a shark anywhere near our legs. That is, of course, unless it’s in the form of a Jaws x Sperry footwear tie-up. 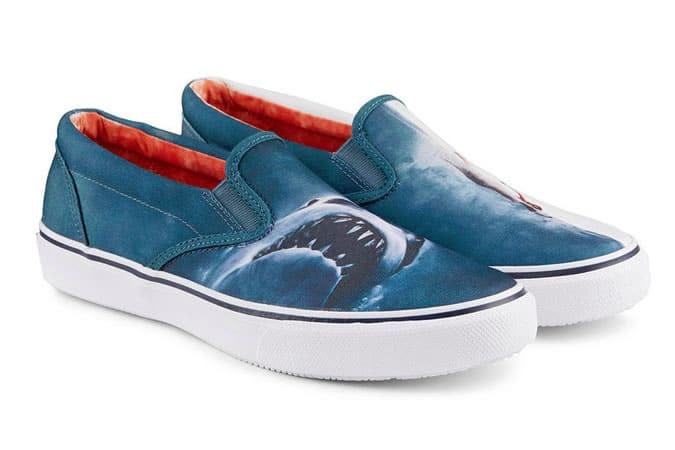 To celebrate the 41st anniversary of the Steven Spielberg classic, the shark-teeth-sharp collection of Sperrys – a brand featured heavily in the movie – uses iconic prints from the film. 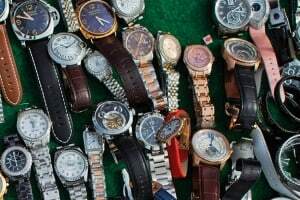 There are no shortage of brands rummaging in their archives this year. The latest to revive a forgotten classic, Puma is bringing back the go-to sports sneaker of the 1970s. Created for basketball’s Walt ‘Clyde’ Frazier, the twist on the original Puma Suede is lighter and wider and comes in ‘home and away’ blue-on-white/white-on-blue colourways. Available only in store at End Clothing, Foot Patrol and Hanon, priced £129. Emerging footwear designer Joshua Sanders has achieved in paring traditional Italian craftsmanship with New York street culture since 2013. However, this time round the brand’s house signature graphics takes it to Los Angeles with initials of the Californian city in black French-terry on khaki-green felt slip-ons. Available at MatchesFashion, priced £200. Yeezy-favoured fashion house Maison Margiela has gone all Jackson Pollock on its footwear once again. In what looks like the result of a dropped tin of Dulux, multicoloured paint splatters have taken over the front of its popular Replica model sneaker. Luckily, the light-blue hue, smooth nubuck construction and designer-stamped tongue keep them away from handyman territory. Available at Harvey Nichols, priced £395. At last adidas has answered calls from sneakerheads to create tonal versions of its UltraBOOST Uncaged runners. For the first time, the brand has applied colour to the patented Boost sole unit to match the Primeknit upper as part of all-over red, black and white iterations. Available from 16 July at adidas, priced £139.50. It didn’t take contemporary Swedish label Axel Arigato long to gain what it calls a “fiercely loyal customer base” after launching in 2014. Put it down to a booming appetite for minimal trainers or its forward-thinking designs and use of premium Italian materials. The brand’s latest drop is no different and also nails the neutrals trend. Available to pre-order at Axel Arigato, priced £125.